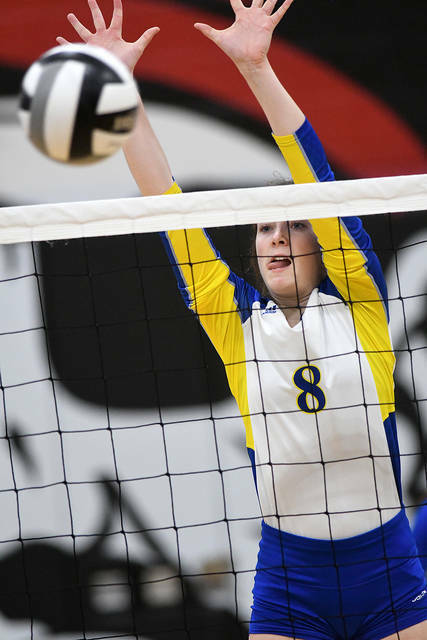 Ben Robinson|GoBuccs.com Lehman Catholic’s Reese Geise goes up for a kill Monday against Covington. Ben Robinson|GoBuccs.com Covington’s Lillian Hamilton hits between the Lehman blocks of Lauren McFarland (20) and Abby Schutt (14). COVINGTON — In a matchup of two of the area volleyball coaching legends, Lehman Catholic and Greg Snipes got past Covington and Lonnie Cain 25-14, 25-10, 25-12. Alexis Snipes dished out 34 assists for the Cavaliers. Olivia Lucia had 12 kills and 10 digs, while Lauren McFarland had 13 kills and 10 digs. Abby Schutt had five kills, four aces and 10 digs, while Reese Geise had six kills and Pyper Sharkins added seven digs. 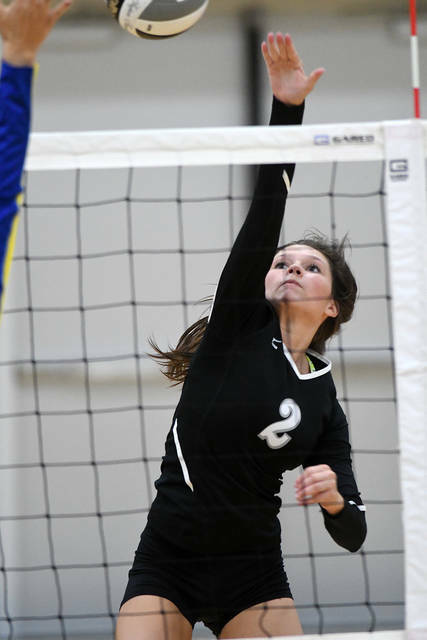 For Covington, Olivia Mohler had four kills, while Lillie Hamilton added three kills. Alyssa Kimmel had three kills and six digs, Hillary Hoying had six digs, Macie White had five digs and Ellery Reck had seven assists and five digs. Lehman won the JV match 25-7, 25-18. 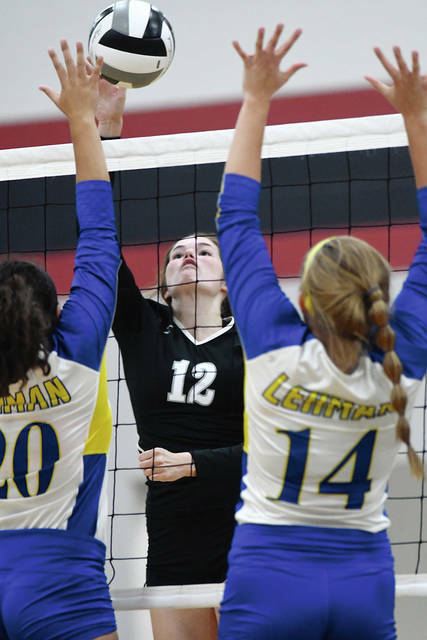 Lehman plays at Wayne tonight, while Covington travels to Twin Valley South Thursday. DAYTON — The Bradford volleyball team defeated Northridge 25-14, 25-15, 25-12 Monday. Lead scorer for the night was Bianca Keener with 18 points and four aces. She also had 10 kills, two solo blocks, and eight digs. Buzz Brewer followed with nine points and three aces. She also had 12 setting assist and six kills. Macie Reck added 16 digs and eight points. COVINGTON — The Covington junior high volleyball teams split two matches with Arcanum Monday. The seventh grade, 12-1 overall and 10-0 in the CCC, won 25-14, 23-25, 25-18. The eighth grade, 9-4 overall and 8-2 in the CCC, lost 25-12, 25-18. Covington hosts Twin Valley South Thursday. The Piqua girls golf team ended their regular season play with a 198-201 win over Franklin Monroe. Seniors Kelsey Bachman and Skylar Sloan shared medalist honors, with each shooting 47. Reece Tate and Adde Honeycutt both shot 52, Kenzie Anderson had a 56 and Hannah Anderson had a 67. Piqua will compete in the GWOC League Tournament Wednesday at Beechwood, and sectional the following Wednesday at Yankee Trace. PITSBURG — The Lehman boys soccer team defeated Franklin Monroe 4-0 Monday. Matthew McDonald had two goals and one assist, while Joshua George and Ethan Potts had one goal each. Elijah Jock had two assists and Michael Denning had one. Goalie Will Voisard got the shutout with 10 saves. FAIRBORN — The Piqua girls soccer team, 4-4-2 overall and 3-3-1 in GWOC American play, will host Sidney Wednesday. Piqua is coming off a 2-1 loss to Fairborn Monday. Tayler Gunkemeyer had the goal for Piqua, while Tanner Grise had six saves in goal. TROY — The Newton girls soccer team lost 4-1 to Troy Christian Monday. Marissa Deeter had the Newton goal, off an assist from Kim Laughman. Newton will host Twin Valley South Thursday. 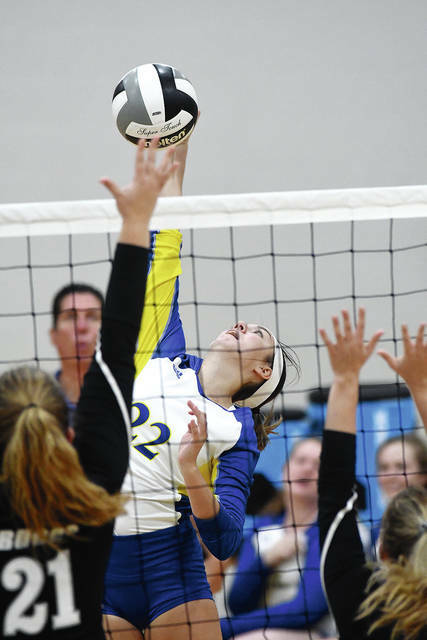 https://www.dailycall.com/wp-content/uploads/sites/30/2018/09/web1_lehman-22.jpgBen Robinson|GoBuccs.com Lehman Catholic’s Reese Geise goes up for a kill Monday against Covington. Ben Robinson|GoBuccs.com Covington’s Lillian Hamilton hits between the Lehman blocks of Lauren McFarland (20) and Abby Schutt (14).